CHICAGO--(BUSINESS WIRE)-- Hyatt Hotels Corporation (NYSE: H), in collaboration with Ken Corporation and Ken Real Estate Lease, Ltd., today announced the opening of Hyatt Regency Naha, Okinawa—the first hotel under a Hyatt brand on the Japanese island of Okinawa. The hotel is the tenth hotel under a Hyatt brand in Japan, and it is the sixth Hyatt Regency hotel in the country, following Tokyo, Hakone, Kyoto, Osaka and Fukuoka. A mere 20-minute drive from Naha Airport, Hyatt Regency Naha, Okinawa is located between Naha’s main street of Kokusai Dori and Tsuboya Yachimun Dori, a historical street lined with traditional pottery workshops. The hotel – offering traditional, warm Okinawan-style hospitality – provides an energizing and refreshing place where both business and leisure guests come to connect. The captivating décor at Hyatt Regency Naha, Okinawa celebrates its local culture. Adorning the interiors are soothing colorways highlighted with vibrant hues of red and blue. 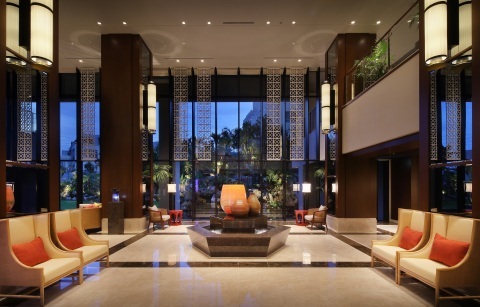 The hotel features carefully selected pottery and glassware inspired by rich Ryukyu culture, complemented by the convenience and comfort for which the Hyatt Regency brand is known. Hyatt Regency Naha, Okinawa is home to 294 guest rooms of eight different types, including 154 Deluxe Twin Rooms (344 square feet / 32 square meters) and nine luxurious Regency Executive Suites (688 square feet / 64 square meters). All guest rooms have been designed for both leisure and business, featuring a 40-inch flat-screen television with satellite programming, complimentary Wi-Fi, a coffee maker and complimentary mineral water. Standard guest rooms offer Pharmacopia natural and organic bath products from the U.S.; Club Rooms and Suites provide body care products by exclusive, historic Italian brand Acca Kappa. The generously appointed suites are designed to reflect the calming wind and water of Okinawa. The large, contemporary rooms feature subtle details inspired by traditional Ryukyu culture and come equipped with a spacious shower room, plush beds dressed in 300-threadcount linens and two 55-inch flat-screen TVs. All Club Rooms and Suites offer access to the exclusive Regency Club lounge. Located on the uppermost 18th floor and featuring an outdoor terrace, guests can gather, work or relax over complimentary breakfast, drinks throughout the day and evening cocktails. Personalized check-in, check-out and evening service is also available. Hyatt Regency Naha, Okinawa offers four inspiring restaurants and bars showcasing international cuisine with a focus on locally sourced ingredients of the highest quality. Sakurazaka is the hotel’s relaxed dining space, serving buffet-style breakfast and lunch with an array of tempting local and international dishes. Guests can enjoy a relaxing meal in the stylish, light-filled setting or dine al fresco on the beautiful outdoor terrace. Located on the uppermost 18th floor, MILANO | GRILL specializes in creative Italian and grilled cuisine. During dinner, a selection of meat and seafood is prepared in the show kitchen, while traditional trolleys present appetizers and mouthwatering grilled fare, served tableside. Adjacent to MILANO | GRILL, guests can enjoy a pre-dinner drink at The Bar, complemented by panoramic night views of the Naha skyline. Featuring live piano performances, The Bar is an ideal spot to enjoy fine wines, carefully crafted cocktails and a wide variety of quality spirits. During the day, guests can look out to the Kerama Islands, and at dusk, enjoy a beautiful sunset over the East China Sea. The glass encased open space on the first floor is The Lounge, offering quality coffees, teas, pastries and light snacks. The Regency (882 square feet / 82 square meters with an 8.8 foot- / 2.7 meter-high ceiling) is a well-designed event space on the second floor, perfect for high-level board meetings, parties and cocktails for up to 50 guests. Equipped with the latest audiovisual capabilities, The Regency can be partitioned into two separate spaces (592 sq ft / 55 sqm and 290 sq ft / 55 sqm), making it ideal for intimate gatherings and parties. On the third floor of Hyatt Regency Naha, Okinawa is the first exclusive hotel fitness center in Naha. The Fitness Gym is equipped with the latest TechnoGym machines and a personal yoga lesson is available upon request. After a good workout, guests can unwind in the whirlpool or take a dip in the 55-foot / 17-meter outdoor swimming pool. An adjacent shallow pool is perfect for younger guests. As a hotel that puts everything at guests’ fingertips, guests who’ve worked up an appetite will enjoy HY Deli for an assortment of goods, from daily necessities to sweets, cakes and cookies, and alcoholic beverages such as beer and wine. Okinawa has long been a popular destination for domestic Japanese travelers looking for a relaxing beach holiday, but in recent years, the island has gained in popularity among international visitors. Okinawa translates to “rope in the open sea,” describing the long stretch of islands between the four main islands of Japan and Taiwan. Okinawa enjoys a subtropical climate throughout the year, making it a perfect year-round holiday destination. With its own languages and customs, born of contact with Taiwan and China as well as the rest of Japan, Okinawa is a land of mixed cultural influences. The most obvious expressions of this unique Ryukyu culture are found in the island’s cuisine and many art forms, which have become the trademarks and pride of the area. Since 1980, Ken Real Estate Lease, Ltd. —an affiliated company of Ken Corporation—has specialized in the development of luxury hotels, ryokans, resorts and business hotels around the world. As of March 2015, the company manages and owns a portfolio of 27 properties worldwide (including 18 in Japan) with a total of approximately 7,200 guest rooms. For more information on Ken Real Estate Lease, Ltd., visit www.ken-realestate.jp/eng. The Hyatt Regency brand is an energizing hotel brand that connects travelers to whom and what matters most to them. More than 145 conveniently located Hyatt Regency urban and resort locations in over 30 countries around the world serve as the go-to gathering space for every occasion – from efficient business meetings to memorable family vacations. The brand offers a one-stop experience that puts everything guests need right at their fingertips. Hyatt Regency hotels and resorts offer a full range of services and amenities, including notable culinary experiences; technology-enabled ways to collaborate; the space to work, engage or relax; and expert planners who take care of every detail. For more information, visit hyattregency.com or facebook.com/HyattRegency.